Arahne CAD/CAM for weaving | NEW ArahView 3D is ready to use! Arahne CAD/CAM for weaving / YENİ ArahView 3D kullanıma hazır! / YENİ ArahView 3D kullanıma hazır! After several month of work we proudly present ArahView 3D. 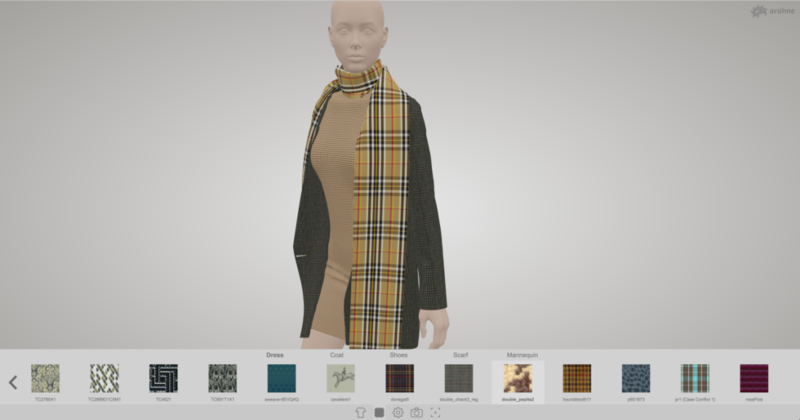 ArahView 3D is Arahne’s new application which allows you to apply designed fabric on the 3D model immediately. We offer a large variety of 3D models: from upholstery, bed linen, bags, shirts, male and female models in different poses, ties, wrinkled fabrics, fabric sample models and much more. Click here and start playing with it now! Choose a model and apply the fabrics that are displayed by icons below. Some of the models consist of different parts, which allows you to apply different fabrics on different parts of the model. Feel free to rotate, move and zoom the model in any direction you want. We support front an back view of the fabric as well as transparent fabrics. ArahView3D is integrated with ArahWeave CAD. That means you can save the fabrics designed in ArahWeave directly into ArahView3D and apply them on the 3D model immediately. For some extra fee our 3D artist can aslo prepare a 3D model according to your choice. ArahView 3D works on any Browser and even on tablets and high quality smartphones. The system handles large volumes of data and stays responsive – we have almost 500 high quality fabric textures (over 2.5 GB of data), and it still works fast. The fabrics used in the configurator are just a small sample of what our customers do. Please note that designs belong to major brands, and you are not allowed to copy them. We only use them to demonstrate ArahView 3D.